Metal sheds are becoming increasingly popular throughout UK gardens, and this building from Shed Baron is a good example of why this is. Looks wise it has abandoned metallic silvers and greys for an attractive green and cream colour scheme that will complement almost any garden environment. Whilst it doesn’t look traditionally metallic it does provide a range of benefits, foremost of which is the fact that this shed doesn’t require any annual treatments, saving the owner time and money. The paint doesn’t only provide an aesthetic function, as it also helps to repel rain and keep the interior dry. This is a pattern that’s repeated by the tall apex roof and by the galvanised metal cladding used across the exterior. 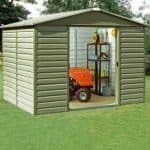 These factors added together mean that the shed is very rust resistant, and so confident are the manufacturers on this point that they supply a 20 year warranty against rust perforations. We would have liked to see an option to add a window, although the fact that windows are lacking can itself enhance the shed’s security. Thanks to the integrated vents, however, you’ll be surprised at the airy and pleasant atmosphere inside. This also helps to prevent the build up of heat and of moisture, a combination that could otherwise lead to condensation. 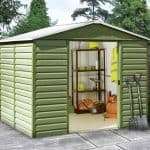 You might also like to see the top 20 cheap metal sheds currently on sale in the UK by visiting the WhatShed cheap metal sheds awards league table. 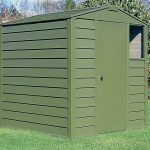 This apex metal shed stands out from many of its competitors thanks to both its dimensions and its attractive paintwork. We were pleased to see that the paintwork had been well and evenly applied, as this gives an indication of the quality that we were to see from the shed as a whole. The shed is approximately twice as wide, with an internal width of 2.945m, as it is deep, the internal depth being 1.435. 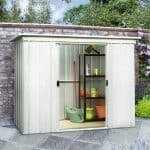 This makes it a great choice for people with shallow gardens who are still looking for a substantial storage facility. We were pleased to see that the shed is topped by an apex roof, and also that it was made of the same tough cladding as the walls. This gives it excellent rain repellency, as well as making it a little taller and even easier to move around in. This wasn’t a problem here, unlike in some other metal sheds we review, thanks to a ridge height of 2.03m and an eaves height of 1.78m. 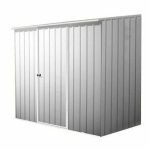 We are used to finding cladding that is thin and light for use on metal sheds in this price range, and that was certainly a feature of this shed in its flat pack form. Once assembled, however, it becomes strong and rigid, and this is because of the toughening process that the steel has been subjected to. Hot dipped galvanisation has been used, which gives a durable zinc plating and increases rigidity. There is no floor included in the kit, so you’ll need to have a flat area of concrete that measures a minimum of 2.945 X 1.435m. At this price, we were disappointed to see that an anchor kit was not included, so the customer will have to buy a set of screws separately with which to fix the shed into the concrete. The strong galvanised cladding not only improves the stability of this shed, it also improves its rust resistance by making it very difficult for water to penetrate the upper layer. We were pleased to see that this point has been acknowledged by the manufacturer in the form of a 20 year warranty against perforations caused by rust. This can bring real peace of mind to the owner, especially as there is no onus on them to carry out any treatments. One of the most noticeable features of this shed is the double sliding doors that are finished in a contrasting cream colour. They are significantly wider and taller than many of the doors we see, with a width of 1.38m and a height of 1.70m. This brings obvious advantages if you want to store long, tall, or unusually shaped items, so we can easily imagine, for example, bicycles or motorbikes being stored inside. We were also pleased to see that the doors themselves had an internal fitting, making them less prone to accidental damage. They were also noticeably thicker and heavier than the cladding around them, which further adds to their security. There are no windows, which is not unusual for metal sheds of this size although we prefer to see customers given the chance to add one as an optional extra. One included feature which does prove very useful, however, is the ventilated gables. It makes a big difference to the interior, particularly on hot summer days. We think that security is the most important feature to consider in a shed if you’re planning on storing anything of value inside. That’s why we would have liked to see a padlock included as a standard part of the kit. Whilst this isn’t the case, the handles are holed and ready for one to be fitted, and we feel that the windowless design itself increases the inherent security by preventing people from seeing what’s kept inside. We would have preferred to see more optional extras available at the point of purchase, as mentioned above we feel that a window or skylight would come in very useful for many customers as it would allow them to use the shed as a mini warehouse. Besides a padlock, which will have to be sourced separately, we would recommend the purchase of shelves. The frame itself is so strong that corner or rear shelves can be screwed directly onto it, and this helps to keep the floor clear and tidy. Shed Baron are known for the quality of their products, despite their affordable pricing. This shed lived up to that reputation, and high quality was apparent throughout. With surprisingly tough cladding, particularly on the heavy gauge door, this shed should last and last as proved by a 20 year warranty period. Even though this isn’t the deepest of sheds, we liked the accommodating width and height, and this in itself should make it an ideal fit for many gardens. When opening the flat pack you’ll find a lot of screws, bolts and tiny components, so we find that the best thing to do is organise them before starting the assembly work. 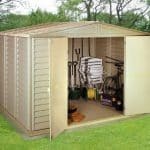 With a friend’s help you should be able to install this shed in approximately four to six hours. 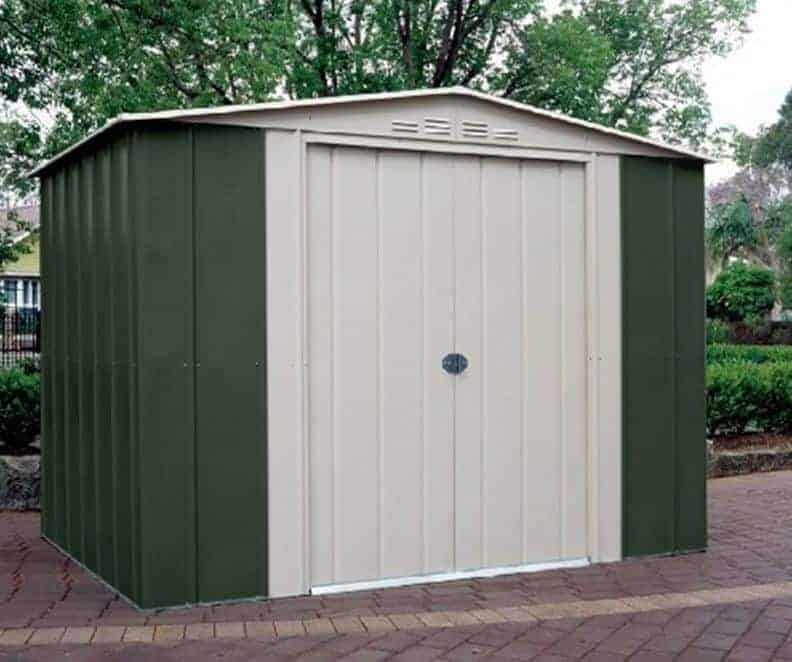 This is not only the largest, it’s the most expensive shed in the Shed Baron Grandale range. Nevertheless, we do feel it represents good value, although we would have liked to see an anchor kit provided. Final Thoughts: When you buy a metal shed, you can put the paintbrush away. It can be a big relief to not have to spend time and money applying wood preserver every year, and that’s even more reassuring when you have a shed such as this one that’s guaranteed against rust damage for 20 years. There’s so much space within this shed, and we were pleased to see that there is also lots of headroom, so you won’t have to work around with a stooped back. With the addition of a padlock and alarm system, which is a purchase we highly recommend, this could be a durable and secure place to store items away from rain and snow.